The move is finally over! Moving is such an exhausting process, no matter how much practice you’ve had. These last three months we were living in a sublet but started our year-long lease on Saturday. It’s incredible how much we’ve collected these last few months. We came to Boston with a couple of suitcases and a bed frame, but this summer we added to that three dressers, a mattress, kitchen supplies, and a bike. Because we had a fair amount of stuff to move, Tri and I decided to rent a small van. In Boston, most leases don’t allow tenants to stay in their old apartment on the night of August 31st, so we had to have everything out by August 30th. Luckily my brother agreed to let us store some things in his basement last week. We decided to try and move most of our stuff by last Wednesday, so that afternoon Tri went to pick up the van from the rental company. About half an hour later, he pulled up to our apartment driving a 16 foot truck! Their website claimed that they rented out vans, but apparently the rental place only has trucks. When Tri rolled up to our apartment in that truck, my jaw dropped. How were we going to drive this monster to my brother’s apartment? Despite our apprehension, we filled the massive truck with all of our stuff, closed the back, and started on the slow journey. As we were leaving the driveway, Tri kept telling me to look out my window to make sure he wouldn’t hit anything. Everything seemed fine, so I told him to keep going. As he turned right out of the lot, we heard a screeeeech, what sounded like metal against metal. I had failed to inform him about a randomly placed poll sticking out from the curb, thinking that Tri would be able to dodge it, but as we turned, it grated against the side of the truck. When I heard the screech, I freaked out and decided that we had to return the truck immediately. We couldn’t back the truck up into the lot, so we spent the next five harrowing minutes going around the block to get back to our apartment building. Once there, we unloaded everything and went to return the vehicle. Maybe I overreacted and it would have been fine, but I’d rather not take the chance. Every time we move we end up reminiscing about the other moves we’ve done. This time we were remembering the one last winter, which was way more complicated but in the end, a little more peaceful. For the first 6 months in Nepal, we lived in a rental house while the new home was being built. Then, last January, we moved to the new place. The first day that we moved into the new house, there were about 20 people going in and out. There were construction guys finishing up extra work, there were movers, and then there were aunts and uncles who came over to help. That morning we had to eat our meal of daalbhaat in the new house, and a few of Tri’s aunts from his dad’s side came over to cook. After we had done a good chunk of work, we sat down for our meal. In addition to daalbhaat, they cooked khir (rice pudding), which is supposedly important to eat on the first day in your new house. The cooking added to the commotion in the house, but it was a nice way to settle in. The huge job of moving a house full of stuff made the move in Nepal much more hectic, but after most of the work was done, we had a puja, which kind of calmed everyone down. 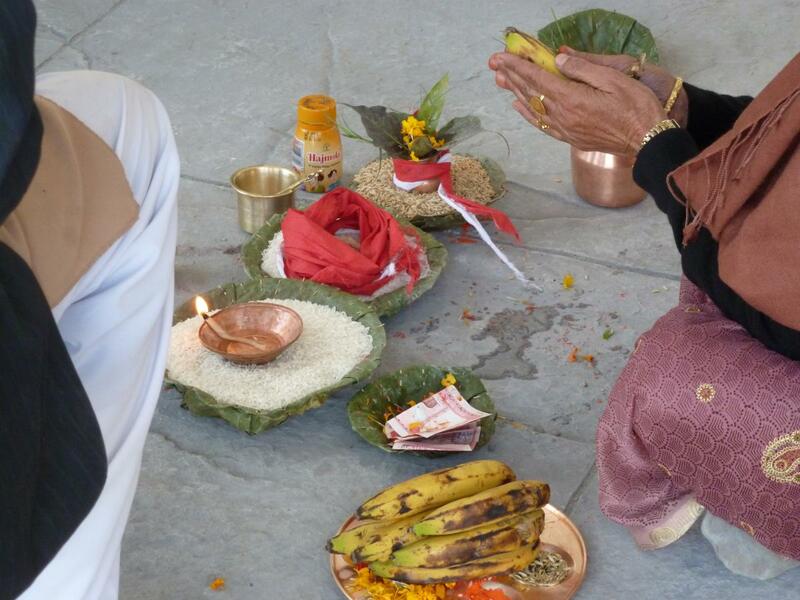 When moving to a new place, puja is supposed to be performed in the new house to bless it. Since we weren’t allowed to be part of pujas last year, someone else had to fill in. One of Tri’s aunts did the job. The priest started by lighting some incense and setting out flowers and fruit in front of the doorway after which he chanted some prayers. Then people in the house gathered and a procession started that went around the house into every room and up to the pujagarne kotha (the small room where the puja is done). 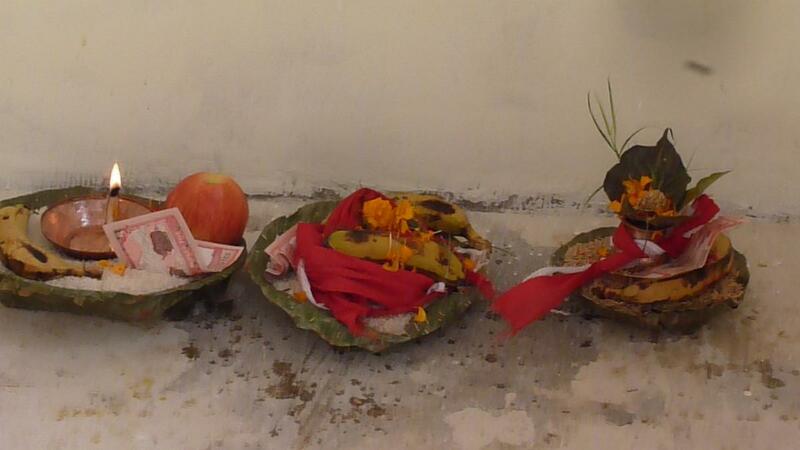 There the priest set out more flowers and fruits in banyan leaf bowls. We didn’t have a puja for our new apartment, but we did have our first home-cooked meal in the new apartment last night. Thanks goodness the stress of the last few weeks is over and we can settle in to our new place! This entry was posted in Nepali Culture and tagged daalbhaat, Moving, Puja, rental truck by nepali jiwan. Bookmark the permalink. Congratulations to you both! It is so great you will be near Sasha. I know you will have an interesting time this winter. Fall is a great time to visit historic sites. The area around Boston can be very beautiful. I really appreciate reading your blog. I just accidentally found it and have been stuck for more than an hour. I am also married in Nepal, but mainly living there with my husband and our daughter. You are describing Nepal in such a loving way and combining facts with personal experiences. I totally love it! Great, let me know if you’re around 🙂 And keep on writing whenever you feel inspired. I’m sure many, and me among them, want to read.